Welcome to Day Nine of The Escapist's Indie Developer Showcase, a 10-day celebration of the designers and programmers who have struck out on their own to make the games they want to make. Each day we'll feature a new game or demo by an up-and-coming indie developer along with a brief interview. Some games are already commercially available, some are works in progress, but all are free to play. To see who's on the schedule or check out what you've missed, click here. Enjoy! Bobby Thurman is the Manager of Callipygian Games and the developer of Secondhand Lands, a free-to-play MMOG that takes place in a fairy tale world full of wolves, sheep and anthropomorphic catgirls. Bobby has been a professional programmer for 19 years, including stints at Aspyr Media and Stray Bullet Games. We spoke with him about Secondhand Lands and what it's like to develop games on your own. Click screenshot to download game. "Secondhand Lands is a place where old stories and fairy tales hang out and mix with each other. Everything's in balance and the world isn't in danger of being destroyed by ultimate evil. You play as a critter, not a humanoid - this was very important to me when I was designing the game. The point is to have fun exploring the world, finding out the stories and secret lives of the non-players characters as you go. Each of the four races has 24 skills with 200 levels of configuration points. We have guilds, factions, PvP, dueling, quests, collections, crafting and a market. My favorite part is the player-to-player mounting. It lets players team up and actually ride together into battle. 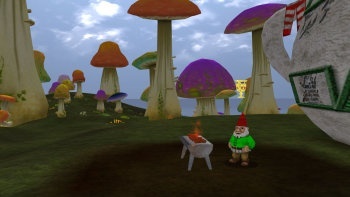 Basically, Secondhand Lands has the feature set of a larger MMO ... just cozier!" "Content is the hardest thing. I can usually estimate programming tasks within 10 percent of the task duration, but I just totally blew it when it came to content. I wrote over 120 quests myself, and at first I was really missing my estimates. By the fourth island, my estimates started to get pretty good. The other tedious thing is to go back and revisit old crummy or grindy quests and making them better. Sure, they're working just fine, but players may complain they're boring, so I go back and spice them up. I could write a whole book on this topic alone." "When suggestions outnumber the bug reports, you know you're near the end. That's a good rule of thumb. Secondhand Lands was at this state in July, but I realized that the game was too small and trivial. We only had two races. After talking a lot with Brian Green and Kelly Heckman, I decided to follow much of their advice. Instead of just adding more quests, I found ways of multiplying the content by adding two additional races, crafting, collection quests, a special dancing area for catgirls and player-to-player mounting." "Music, movies and YouTube. I discovered the entire Pufnstuf movie uploaded the other day. A lot of my friends would give me blank looks when I'd refer to it. Also, I get really antsy if I'm not making something, so when I'm not programming I work on various projects - stained glass, sewing or carpentry. Taking vacations longer than two days get me really anxious." "I think the biggest challenge is for the big companies to stop putting their money in high-end graphics (bump mapped/photo-realistic) and to concentrate on high-end gameplay instead. If we had made the advances in gameplay that have been achieved in the last 10 years in 3-D graphics, then we'd have some really amazing multiplayer games. I'm a hypocrite on this issue, but the Wii guys totally get it."